Star Wars Weekends 2014 returns to Disney’s Hollywood Studios at Walt Disney World Resort starting May 16. 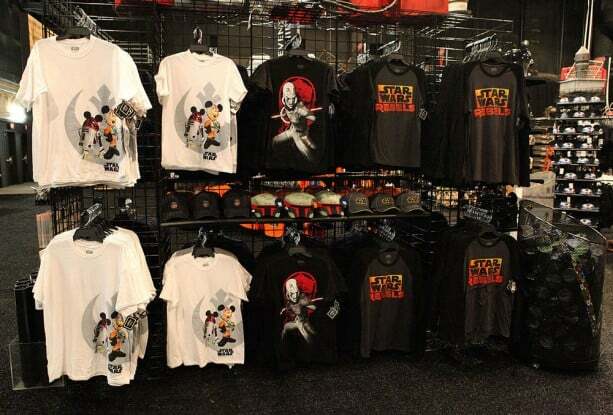 You may recall I shared a first look at some merchandise created especially for this event along with details about the fan-favorite Star Wars – D-Tech Me Experience. This year, these items and more will be found in Darth’s Mall, the out-of-this-world merchandise shop located in Soundstage 1 between Studio Backlot Tour and Toy Story Midway Mania. I recently visited the location as the merchandise team was putting on the finishing touches. Here are a few images of some of my favorite things I found. 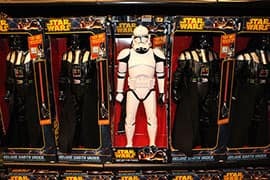 Toys have been an important part of Star Wars ever since Star Wars: Episode IV A New Hope debuted in theaters in 1977. 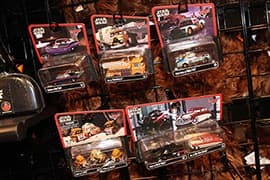 I was happy to see several new toys not previously discussed including a new wave of Disney-Pixar’s Cars as Star Wars characters and a giant clone trooper that is unique to Disney Parks. 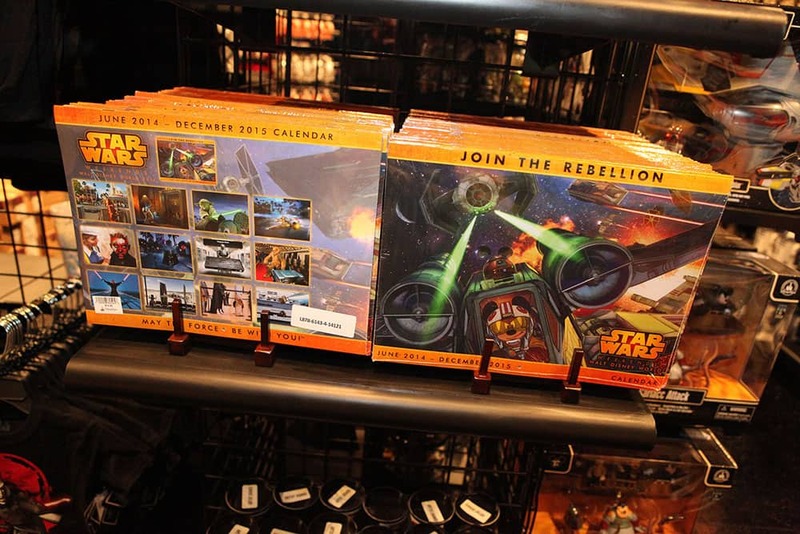 Other favorite items include a calendar that contains marketing artwork for Star Wars Weekends, light-up glasses and reusable tote bags. There will also be several new apparel items including items from Ashley Eckstein’s incredible Her Universe line. I love the dress that reminded me of bed sheets and curtains I once had as a child! Speaking of apparel, we will be offering select Star Wars Rebels shirts on our Disney Parks online store from May 16-22. These will be the same shirts offered at Darth’s Mall, just in case you aren’t able to attend the event this year. Visit http://www.DisneyStore.com/ParkEvents to place an order. 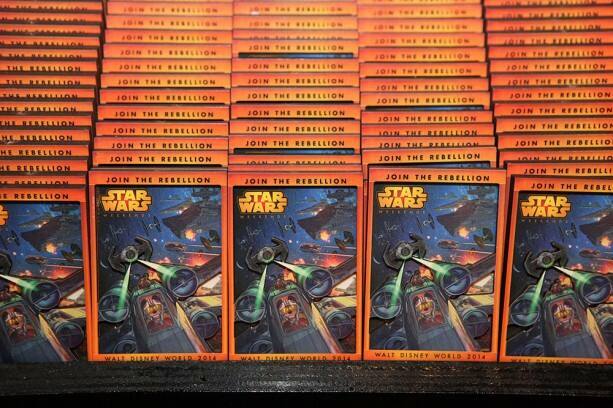 I hope to see you at Star Wars Weekends! Steven, do you know if the LE Star Wars Vinylmation that is being released on June 13 will be sold at Darth’s Mall? Thanks! 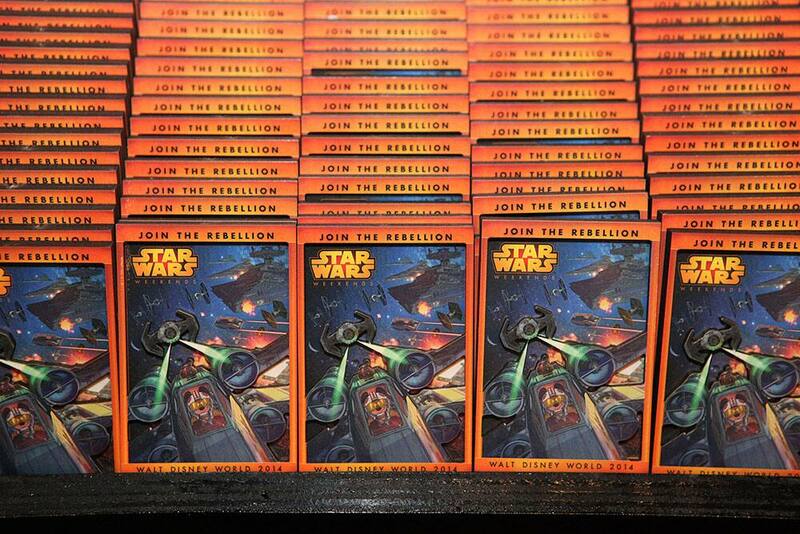 Hi Steven… Do you know how much those Star Wars Weekends CALENDARS are? Hard to see from the pic. 😉 Thanks! @Carl – The retail is $12.95 plus tax. Hi there! I am heading to Disney World Monday and will be at Hollywood Studios Tuesday for a normal day and Friday for a Star Wars Day! Do you happen to know if Darth’s Mall is open on a day apart from the Star Wars Weekend events such as on this Tuesday? Thank you!! I am dying to get the new Han Solo dress from Her Universe! @Jennifer – I hope you have a wonderful trip. Unfortunately, Darth’s Mall is only open during Star Wars Weekends. It won’t be operational on Tuesday. As for the Han Solo dress (which is amazing), you may be able to find it online. I would do an online search for “Her Universe” since it was created by Ashley Eckstein. I’m sorry I don’t have better news. This is a response to Post #12 from Anthony on May 17. I saw the Donald as Boba Fett statue available at the Walt Disney Story on Main Street at the Magic Kingdom when I was visiting on Mother’s Day! New 2014 Merchandise — Trash Can salt and pepper shakers SOLD OUT! Any chance you’ll restock? Will they be available again soon? @Brenda – I’m guessing you are referencing the ones that were at Disneyland Resort or on the Disney Parks online store recently. They are coming to the Marketplace Co-Op in Downtown Disney Marketplace in Florida very soon. Yes, there will be additional reorders yet I do not have exact timing. I have been trying to find this out all over the net, but cannot. Is there a large supply of the AP merch? I will be attending next friday, and really want one of those t-shirts. I hope there will still be availability! @Anthony – There are shirts, a coin and a pin created for Annual Passholders. From my understanding, they should still have shirts. The limited R2-D2 & R2-MK Vinylmation and the Rancor Vinylmation were sold out before the end of the first day. Will they be getting more for next weekend? Last year or the year before I was able to order the Donald as Boba Fett statue on the phone. R we able to order the statues via phone again? If so is there a specific date we can we start? @Anthony – You can try contacting our Merchandise Guest Services team again. They may have access to such things (stressing the word “may”). Try either by telephone at 877-560-6477 or by email at Merchandise.Guest.Services@DisneyParks.com. Is there someplace online I can see what star wars art is for sale? @Tom – At this point, we do not have such an option. I’m sorry I don’t have better news. Are non star wars characters out at their scheduled times during star wars weekend? @John – That’s a great question. I would recommend picking up a Times Guide when entering Disney’s Hollywood Studios. This should give you lots of details as to when things will happen on the day you visit. Could I get the merchandise number for the calendar? Thanks! I can’t wait to get in there tomorrow. I will be on one of the 1st buses from my resort headed to DHS in the morning. I usually plan my vacation round Star Wars Weekends. 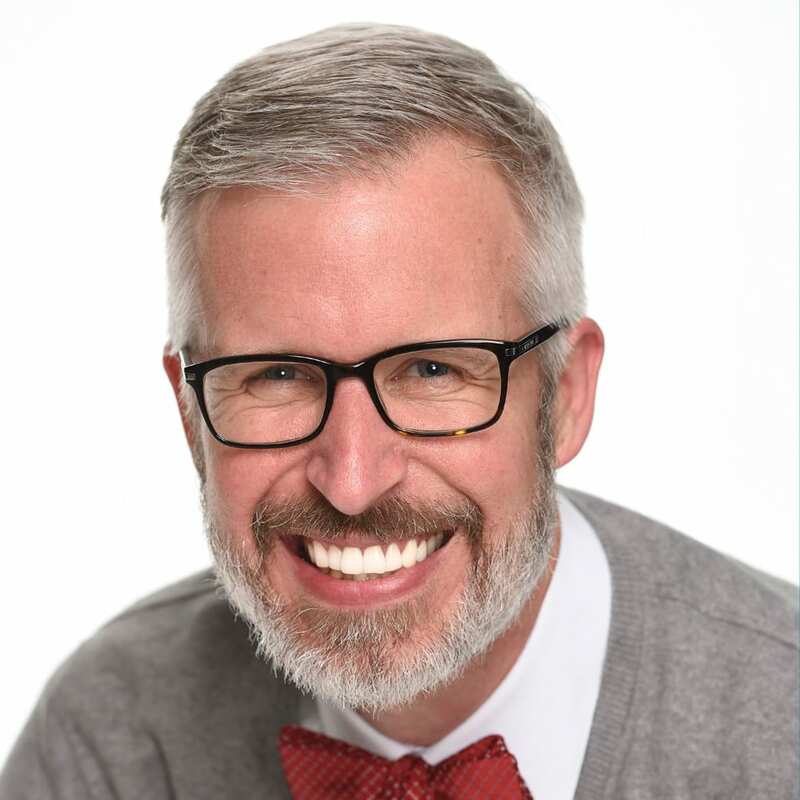 @aaron – Yes, Darth’s Mall has moved (at least for this year… not sure about it in the future). It’s located next to Toy Story Mania at Soundstage 1. The marquee says “Darth’s Mall” on it. @Martine – Yes, it’s a Han Solo dress. It’s cute and my wife loved it! Not sure about phone orders. It’s from Her Universe (look it up on Google). Any new Disney characters as Star Wars character plushes this year? @Tracy – I know there are a few different plush being offered this year. I saw Mickey Mouse in an X-Wing pilot outfit. There are also some plush that were recently introduced at Disney Stores including an incredible Bantha (it’s so fluffy! LOL). So im assuming that Darths Mall has moved and is no longer behind rock and roller coaster?? Please tell me that the other dress next to the one you spoke of is a Hans Solo dress? Can we get these items via the merchandise phone order? Thanks for your help! @Rodolfo – That is correct. Darth’s Mall is only open on Friday, Saturday and Sunday during Star Wars Weekends. 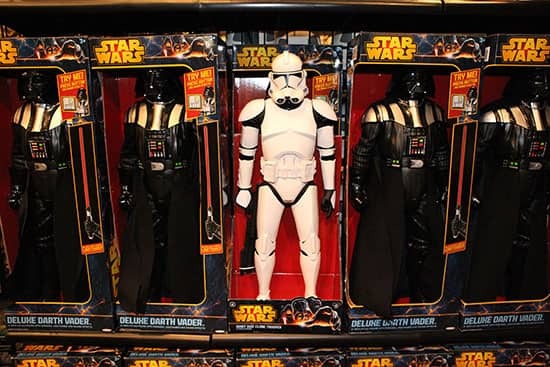 You can always visit Tatoonie Traders to find other Star Wars related merchandise. 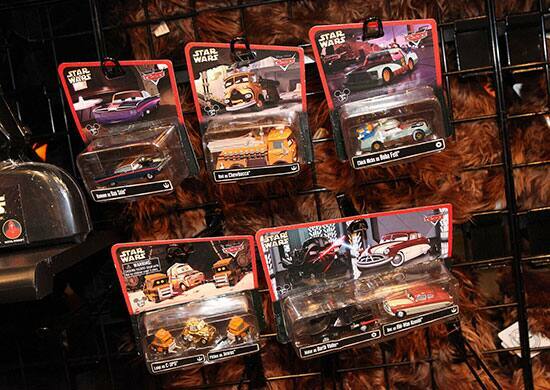 That location, however, won’t have the same assortment as Darth’s Mall. Looking forward to my first visit during Star Wars weekends. What are the items in the first photo? They look cool but I’m not sure what they are. @John – I hope you have a wonderful trip. The first image is magnets with the official logo. Was just in there today at the Rebel Rendezvous and got tons of stuff! It’s AWESOME!